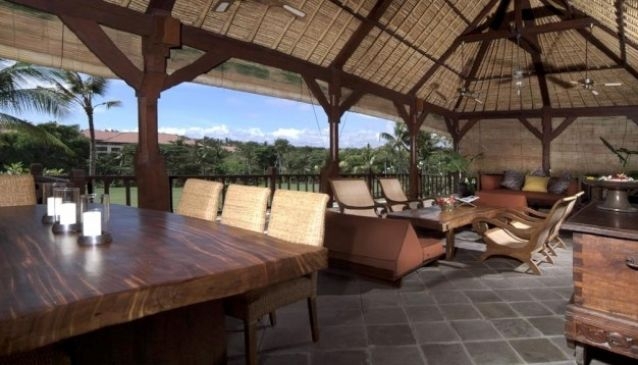 Villa Surya provides a wonderful environment for guests to relax in a Balinese setting with breathtaking views of the golf course and the Indian Ocean. The master bedroom on the ground floor has an en-suite marble bathroom. Sliding doors lead to the plunge pool, comfortable lounge chairs and a bale, the perfect place to enjoy massages. Up the stairs are the second and third bedrooms, also en-suite. The pavilion is furnished with a large day bed, lounging chairs and a dining table for eight persons.